Field documentation received by KHRG since the beginning of 2013 indicates a decrease in forced labour demands by Burma/Myanmar civilian and military officials in some areas of the southeastern Myanmar. In other areas, forced labour demands continue unabated, with some following the predictable pattern of Tatmadaw reliance on nearby civilian populations. This report contains a total of 25 translated copies of order documents issued by military and civilian officials of Myanmar’s central government to village heads in southeastern Myanmar between November 2009 and July 2013, including 17 order documents issued since January 2012. The order documents collected here include demands for: attendance at meetings; the provision of bamboo or thatch for military camp maintenance; labour for infrastructure development; completion of the registration and distribution of land use permits; and for arbitrary tax collection. In almost all cases, villagers received no compensation for the goods or services demanded of them. Most demands articulated in the orders presented in this report involved some element of forced labour in their implementation and were typically backed by implicit threats of violence. To provide additional context for forced labour incidents documented by KHRG during 2013, original excerpts from 15 pieces of KHRG field information are also included (See Appendix 1: Forced labour during 2013). These documents describe forced labour demands for military camp maintenance or building; labour for infrastructure development; portering; service as messengers; and agricultural labour. These documents cumulatively serve as primary evidence of ongoing exploitative local governance in rural Myanmar. This report thus supports the continuing testimonies of villagers regarding regular demands for labour, money, food and other supplies to which their communities are subjected to by local civilian and military authorities. Download the full report by clicking the link in the left panel of this page. In 2013, forced labour continues to be reported by villagers living in KHRG’s seven geographic research areas in southeastern Burma/Myanmar, which incorporate all or part of Kayin and Mon states, as well as Bago and Tanintharyi regions. As evidence of ongoing exploitative demands, this report comprises 25 translated order documents issued by Republic of the Union of Myanmar (RUM) government officials and officers of the State army, referred to as the Tatmadaw, and its integrated Border Guard Forces (BGFs). These orders were issued in Hpapun, Hpa-an and Toungoo districts, which are three of the seven locally-defined Karen districts of southeastern Myanmar. They were issued between November 2009 and July 2013; six of the orders contained in this report were issued since January 2013. 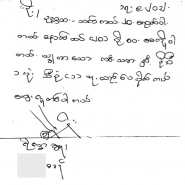 Out of the 25 total documents, nine were issued by Myanmar government or Tatmadaw officials, seven were issued by Tatmadaw BGF battalions, six were issued by the then Democratic Karen Buddhist Army (DKBA) and three were issued by a BGF-backed religious leader. BGF battalions of the Tatmadaw were established in 2010, composed mostly of soldiers from former ethnic armed groups. Pursuant to its obligations under the ILO Forced Labour Convention, the RUM is obligated to apply the ban on forced labour ‘to the territories placed under its sovereignty, jurisdiction, protection, suzerainty, tutelage or authority’. Thus, demands on the civilian population issued by Tatmadaw or BGF battalions should be understood as having been sanctioned by RUM officials. Despite the formal integration into the Tatmadaw, BGF battalions remain subject to semi-autonomous hierarchies that may impact how soldiers behave on the ground. Senior Tatmadaw BGF Commander Maung Chit Thu highlighted this in a recent speech: “We are under the control of the Defense Minister, but we do not follow any of his words effectively. We look at the mother organization [Karen National Union]. If the mother organization builds sustainable unity, we will start one step toward it already”. To provide additional context for forced labour incidents documented by KHRG community members during 2013, original excerpts from 15 pieces of KHRG field information are also included (See Appendix 1: Forced labour during 2013). Throughout 2012, descriptions from villagers in all of KHRG’s seven geographic research areas displayed a continuation of predictable and long-established patterns of forced labour and other demands. Since the beginning of 2013, however, field documentation received by KHRG has shown a marked decrease in forced labour demands by Tatmadaw forces throughout the seven locally-defined Karen districts. 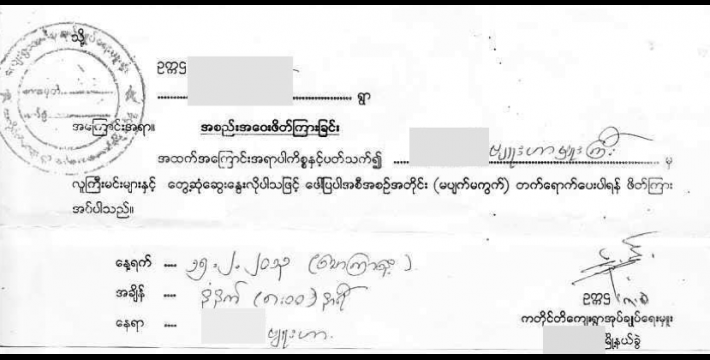 KHRG continued to receive reports of demands for forced labour for military camp maintenance by Tatmadaw soldiers in the Lay Kay area in Bilin Township, Thaton District throughout the first half of 2012. However, in April 2013, KHRG received information that forced labour in Lay Kay had ceased altogether since September 2012. In Than Daung and Tantabin townships, Toungoo District, where villagers had previously been subject to regular demands for labour, villagers described the regular patrolling of Tatmadaw troops, but without demands for forced labour at the end of 2012. KHRG has not documented any incidents of forced labour in Mergui-Tavoy and Dooplaya districts in 2013. Tatmadaw Infantry Battalion (IB) #96 demanded portering and messenger service from villagers in Dwe Lo Township, Hpapun District throughout January and February 2013. In Bu Tho Township, Hpapun District, BGF Battalion #1014 and #1013 soldiers have demanded forced labour for military camp building and maintenance regularly since 2011, with the most recent demands being made in February 2013. Further south, in T’Nay Hsah Township, Hpa-an District, Tatmadaw Light Infantry Battalions (LIBs) #547, #548 and #549 have continued a previously established pattern of ordering agricultural forced labour from villagers, with ongoing demands reported as recently as May 2013. In Nyaunglebin District, Tatmadaw LIBs #349, #590 and IB #30 were documented ordering portering of rations and labour for military camp maintenance in Mone Township in February 2013. As members of the local community explain, the decrease in forced labour demands in some areas may be attributed to the joint activities of human rights documentation organizations and the International Labour Organization (ILO) to pressure Government officials and area commanders to end forced labour, or it may simply reflect the impact of the ceasefire agreement between the RUM and the KNU. “(1) Forced labour stopped after we [KHRG] submitted the forced labour incident to the ILO; (2) forced labour stopped after the Karen National Union and Myanmar government signed the ceasefire agreement; or (3) forced labour stopped for the reason that Burmese soldiers [Tatmadaw] now dare to go and cut down trees and bamboo from the forest by themselves." The ceasefire has also led to some negative trends for villagers. In some cases, Tatmadaw soldiers continue to issue forced labour demands, but do so in a less aggressive manner. It has also allowed Tatmadaw soldiers to travel more freely, as they are no longer concerned about possible Karen National Liberation Army (KNLA) ambushes. At the same time, ongoing militarisation and the presence of Tatmadaw soldiers continues to threaten the local community. Under the preliminary ceasefire agreement signed in January 2012, the RUM and the KNU agreed to “immediately end forced labour, arbitrary taxation and extorted villagers (sic)” as a matter of principle. One month later in February, the Government adopted the Ward or Village Tract Administration Act, repealing the Village and the Towns Act of 1907 and providing for the punishment of individuals who exact forced labour as a civilian penal offence, rather than under martial law. In March that year, the Government committed itself to a joint strategy with the International Labour Organization (ILO) towards the complete elimination of forced labour by 2015, including forced labour imposed through land confiscation or resulting from the absence of necessary funding for authorities at the local level for infrastructure requirements, as well as forced labour associated with public works, construction or energy projects and in the private sector. In recognition of this progress, delegates at the June 2013 International Labour Conference (ILC) adopted a resolution to lift all remaining ILO sanctions on Myanmar. The Conference initially imposed restrictions on Myanmar in 1999 and 2000 to pressure the Government to bring its legislation on forced labour in line with ILO Forced Labour Convention No. 29; end forced or compulsory labour imposed by authorities, particularly the military; and to enforce adjudication and prosecution of perpetrators. The resolution adopted by the Conference calls on ILO member states to provide financial support for the elimination of forced labour and invites the ILO’s Governing Body to review the situation in Myanmar on issues relating to ILO activities, including freedom of association and the impact of foreign investment on decent working conditions in the country. It also requests the ILO and the RUM to continue their commitments outlined in the 2007 Supplementary Understanding, the 2012 Memorandum of Understanding (MOU) and associated action plans for the elimination of all forms of forced labour by 2015. The ILO Director-General will submit a report to the ILO Governing Body sessions in March of each year until forced labour is perceived eliminated from the country. This report serves to support the RUM and ILO’s marked endeavours to eliminate forced labour in Myanmar, both by seeking accountability for commanding officers who have continued to issue orders in 2012 and 2013 and by advocating for greater awareness-raising activities and the dissemination of materials that can be used at the grassroots level by villagers seeking to negotiate or resist compliance with forced labour demands. In particular, KHRG advocates for further translation of the ILO’s complaints mechanism brochure into local languages; the wider dissemination of the Joint Action Plan and strategy for eliminating forced labour agreed to by the Government; and further awareness-raising activities for civilian and military authorities. It is imperative that government and military officials, as well as all ethnic armed groups, take action in line with their commitments to end forced labour as mentioned above. With 2015 just 15 months away, villagers continue to face exploitative demands. Forced labour drastically cuts down the time available to villagers to pursue their own livelihoods. Moreover, it encourages whole communities to continue avoiding contact with armed actors and Government officials and, in many cases, to continue to hide in spaces outside of state authority. It further obstructs the voluntary return of internally displaced villagers and refugees, even where armed hostilities have ceased. Finally, KHRG research areas include some of the most heavily landmine-contaminated places in the world. As a result, forced labour entails increased risk of landmine-related injury or death, by forcing villagers to work in areas likely to be mined, to work in proximity to armed troops and also by requiring them to travel to and work in unfamiliar areas where they may not be aware of the locations of mines. All actors interested in improving human rights conditions in southeastern Myanmar and in creating more space for villagers to pursue their own livelihoods safely and effectively, including villagers previously living in hiding or seeking refuge outside of Myanmar, must press for an immediate cessation of forced labour demands. The Tatmadaw's ‘self-reliance’, ‘self-sufficiency’ or 'live off the land' policy, which provides that local battalions rely on the forced extraction of resources, labour and material support from the civilian population rather than top-down or centralised support, has been well documented by KHRG as well as by respected historians of Myanmar's military. The military’s widespread dependence on the civilian population has long been confirmed by the ILO, which notes “Government officials, in particular the military, treat the civilian population as an unlimited pool of unpaid forced labourers and servants at their disposal.” In March 2012, Myanmar’s government explicitly acknowledged, for the first time, that the forced extraction of resources, labour and material support from the civilian population to support troops was a pre-existing matter of policy, when it vowed to abolish “forced labour associated with the Ministry of Defence self-sufficiency policy” by 2015. Andrew Selth dates the ‘self-sufficiency’ policy to 1997, when Myanmar's War Office reportedly issued an order instructing the country's Regional Commanders “to meet their basic logistical needs locally, rather than rely on the central supply system.” Since troops are often unable or unwilling to grow or purchase sufficient food and resources to subsidise their minimal rations, in practice this means that the Tatmadaw is logistically dependent on civilian labour to carry supplies and equipment, build army camps, maintain roads and cultivate agricultural projects, as well as provide material support, including the provision of rice, food, animals and building materials. As a consequence, local Tatmadaw units and subordinate armed groups often support themselves via forced extraction of labour, money, food and supplies from local villagers in order to sustain frontline troops and ongoing military operations. Given the pervasive and persistent character of exploitative demands levied on rural communities, such abuses contribute significantly to poverty, livelihood vulnerability, food insecurity and risk of displacement for large numbers of villagers across rural eastern Myanmar. To comply with demands, villagers must divert valuable time, labour, money and other resources away from their own livelihoods, reducing their capacities to meet their household or community needs. Extractive demands are frequently issued in the form of written order documents. Such documents are written by the officers themselves or otherwise dictated by an officer and written down or typed by a scribe; these are then dispatched to particular villages by a messenger, who is frequently a local villager forced to serve in this capacity uncompensated. Over the last 20 years, order documents have been important evidence of the continued use of forced labour in Myanmar. In response, military authorities have been increasingly reluctant to identify the camp location or the battalion from which an order is issued (See Orders #4, #10). Order letters are also written in such a way that it may be difficult to identify the author of the letter. For example, civilian and military officials may refer to themselves only as ‘Chairman’ (Orders #2, #6) or ‘Officer’ (Order #14). In other instances, officers have written ‘behalf’ next to their title and signature despite being the author of the order letter, in order to obscure the source of authority for the letter (Orders #5, #10, #23). As one KHRG community member explains in a supplementary order note, “The order letter was written by the Operations Commander, but he wrote ‘behalf’” next to his title(Order #5). 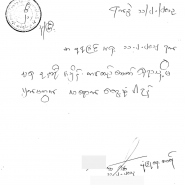 Another tactic is to have Government officials issue order letters for civilians to attend meetings with Tatmadaw officers, instead of the order letter being issued by a military authority (Orders #2, #3). 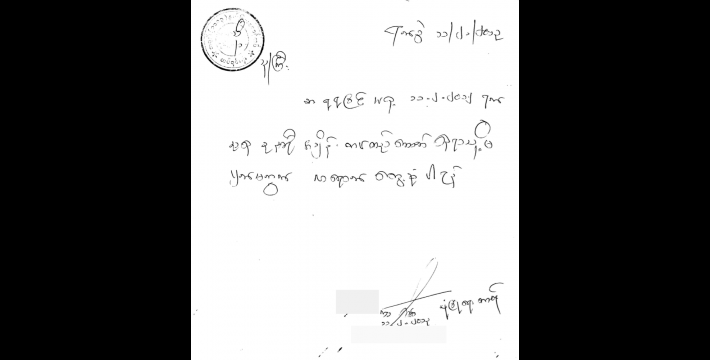 In addition to obscuring the origin of order letters, Myanmar civilian and military officials have increasingly produced order letters that do not contain specific written demands for labour. Instead of receiving such details, village heads are frequently called to attend ‘meetings’ at which military or civilian authorities explain verbally what is required. Of the 17 order documents included in this report issued in 2012 and 2013, six contain requests for village heads or other representatives to attend meetings (Orders #2, #5, #7, #10, #11, #14), and none of them articulate any further demands in writing. When possible, order documents are accompanied by explanations written by KHRG community members of what occurred in the meetings (‘order notes’), which may serve as evidence of forced labour. 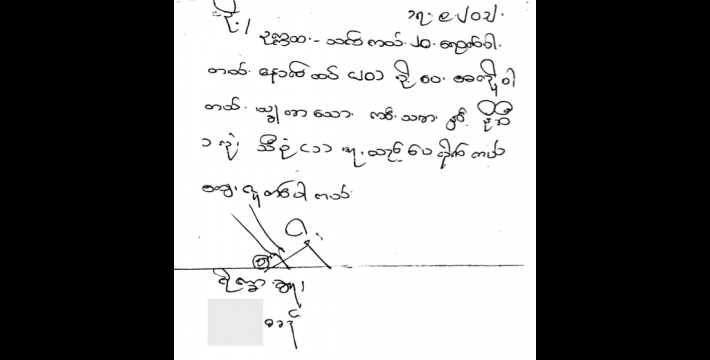 These order notes also demonstrate that Myanmar military and civilian officials are reluctant to submit demands in writing. For example, notes corresponding to three of the order letters explain that demands for the provision of thatch and bamboo for military officers were made during the subsequent meetings (Orders #10, #11, #14). A different order letter requests a meeting to discuss the construction of a vehicle road, while the supplementary note explains that, in the meeting, villagers were ordered to work on its construction (Order #3). Order letters from all groups included here were either hand-written or typed, and were often certified by an official stamp. As well as the order letters issued for meeting attendance, this report also contains order letters issued by military or civilian government authorities demanding that villagers provide bamboo or thatch for military camp maintenance (Order #4); perform labour for infrastructure development (Orders #3, #23, #24, #25); complete the registration and distribution of land use permits (Order #1); attend a meeting about village development or security (Order #5); and pay an arbitrary tax (Order #6, #12, #13, #15). KHRG has received a decreasing number of order letters each year, with 207 received in 2011, 58 received in 2012 and 25 received this year. Despite this decrease, demands for forced labour strongly resembling those related to the self-sufficiency policy continue to be present in the written order letters and other KHRG documentation. In one instance, a Tatmadaw officer explicitly stated a reliance on villagers for the production of thatch (Order #4) while, in a different case, villagers living near a road were ordered to repair it after rain damage prevented the transport of Tatmadaw rations (Order #3). In a notable case in January and February 2013, 184 villagers from 30 villagers were ordered to provide ‘voluntary’ labour for a religious leader for the construction of a bridge, with security provided for by a BGF battalion. One villager explained that villagers felt they were unable to decline the request and therefore the labour was not voluntary (Orders #23, #24, #25). In addition to demands for labour, order documents in this report include other exploitative demands for the provision of money. Common examples include arbitrary taxes that villagers must pay in order to travel (Order #6) or transport goods or livestock past road checkpoints (Orders #12, #13, #15), as well as an order to process land registration documents that may affect villagers’ ownership rights (Order #1). While most order letters written in 2012 and 2013 do not contain explicit threats of reprisal, some orders included in this report do state that villagers or village heads must attend meetings ‘without fail’ (Orders #7, #14) or ‘without absence’ (Orders #2, #10, #23). Such orders carry an implicit threat when written by authorities with a history of perpetrating abuse. The Democratic Karen Benevolent Army (DKBA), formerly the Democratic Karen Buddhist Army, was formed in December 1994 and was originally a breakaway group from the KNU/KNLA that signed a ceasefire agreement with the Myanmar government and directly cooperated at times with Tatmadaw forces. The formation of the DKBA was led by monk U Thuzana with the help and support of the State Law and Order Restoration Council (SLORC), the name of the military government in Myanmar at that time. For more information on the formation of the DKBA, see "Inside the DKBA," KHRG, 1996. The DKBA now refers to a splinter group from those DKBA forces reformed as Tatmadaw Border Guard Forces, also remaining independent of the KNLA. As of April 2012, the DKBA changed its name from "Buddhist" to "Benevolent" to reflect its secularity. While Tatmadaw and DKBA units have for years operated together, this operational hierarchy became formalised with the DKBA’s transformation into a ‘Border Guard Force’ under control of the Tatmadaw and containing a fixed quota of Tatmadaw officers; see “DKBA officially becomes Border Guard Force” Democratic Voice of Burma, August 2010; see also “Exploitation and recruitment under the DKBA in Pa’an District,” KHRG, June 2009. A September 2010 ceremony marked the official transformation of DKBA into Border Guard Forces; after this point, BGF battalions started operating as Tatmadaw. See, for example: “Border Guard Force formed at Atwinkwinkalay region, Myawaddy Township, Kayin State,” New Light of Myanmar, September 2010. See ILO Forced Labour Convention 1930, Art. 26. Commander Maung Chit Thu was the operations commander of Democratic Karen Buddhist Army (DKBA) Battalion #999 prior to the DKBA transformation into the Tatmadaw Border Guard Force, which began in September 2010. His role has grown considerably since the transformation, and he is now second in command of Tatmadaw BGF forces. Commander Maung Chit Thu spoke these words at a Karen Armed Groups Meeting in Htoh Kaw Koh on May 28th 2013 in response to an accusation that “Maung Chit Thu’s group [the BGF] had become Burmese people (sic)”. It is likely that ‘one step toward it already’ is referring to the progress being made at the meeting, attended by representatives from the DKBA, BGF, KNU/KNLA and the KNU/KNLA Peace Council (PC). For a description of patterns of forced labour in Myanmar, see “Background on forced labour and orders” below. For analysis of KHRG’s documentation describing forced labour in 2012, please see Civilian and Military order documents: August 2009 to August 2012, KHRG, October 2012.For descriptions of exploitative demands for food and the large-scale confiscation of land in Papun District, see “Papun Situation Update: Dweh Loh Township, January to March 2012,” KHRG, May 2012; and “Papun Situation Update: Bu Tho Township, Received April 2012,” KHRG, May 2012. For details about forced labour on military agricultural projects in Pa’an District, see: “Forced labour and extortion in Pa’an District,” KHRG, June 2012. For details about the forced transportation of military supplies and functional sweeping for landmines by civilians during road construction in Toungoo District, see: “Ongoing forced labour and movement restrictions in Toungoo District,” KHRG, March 2012. For a description of rations transport in areas known to be heavily mined, see: “Abuses since the DKBA and KNLA ceasefires: Forced labour and arbitrary detention in Dooplaya,” KHRG May 2012. For a description of the forced production of building materials in Thaton District, see: “Forced labour in Bilin Township,” KHRG, April 2012. For a detailed description of forced labour ordered by Tatmadaw LID #44 soldiers and analysis of its end by September 2012, please see “Persistent forced labour demands stop in six villages in Bilin Township as of September,” KHRG, July 2013. Unpublished photo notes written by a KHRG community member explain how Tatmadaw LIB #44 soldiers in Than Daung Township, Toungoo District were seen portering their own rations instead of relying on the local community in December 2012. See Order documents issued in 2013 below; see also Appendix 1: Forced labour in 2013 below. Demands for forced labour by IB #96 are described in an unpublished Situation Update written by a community member from Hpapun District who has been trained by KHRG. The report was received in February 2013 (See Appendix 1: Source document #9). For examples of KHRG documentation describing demands for forced labour and other abuse by BGF #1013 and #1014, see “Papun Situation Update: Forced labour in Bu Tho Township, January to February 2013,” KHRG, April 2013 (See Appendix 1: Source document #4); see also “BGF #1014 Warrant Officer injures villagers and steals property in Hpapun District, January and May 2013,” KHRG, October 2013; see also “Violent abuse and forced labour in Bu Tho Township, November and December 2012,” KHRG, July 2013; see also “Papun Situation Update: Bu Tho Township, November 2011 to July 2012,” KHRG, April 2013. For KHRG documentation of Tatmadaw LIBs #547, #548 and #549 demanding forced labour in May 2013, see Appendix 1: Source document #15; for documentation from 2011 and 2012, see “Pa'an Situation Update: T'Nay Hsah Township, September 2011 to April 2012,” KHRG, July 2012. Between February and April 2013, 58 villagers and their carts were used to transport rations for the Tatmadaw LIB #590 and IB #30; this incident is described in an unpublished Situation Update written by a community member from Nyaunglebin District who has been trained by KHRG. The report was submitted to KHRG in May 2013 (See Appendix 1: Source document #10). Forced labour ordered by Tatmadaw LIB #349 is described in an unpublished short update submitted by the same community member in May 2013 (See Appendix 1: Source document #11), as well as in a phone call with KHRG in July 2013. This information was received in April 2013 from a community member trained by KHRG in Lay Kay area, Bilin Township, Thaton District. 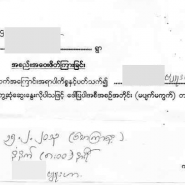 This information was submitted to KHRG in November 2012 as a supplementary order document from a community member who has been trained by KHRG in Hpa-an District; for the associated order letter, see Order #4 in this report. This information was submitted to KHRG in January 2013 in photo notes written by a community member trained by KHRG in Tantabin Township, Toungoo District. See “Statement on initial agreement between KNU and Burmese government,” Karen Nation Union Website, January 13th 2012. See “Discussions in the Governing Body” in Observation (CEACR) - adopted 2012, published 102nd ILC session, 2013. For the full text of the 2012 Memorandum of Understanding between the ILO and the RUM, see ILO Governing Body “Developments concerning the question of the observance by the Government of Myanmar of the Forced Labour Convention, 1930 (No. 29)” Geneva, 313th Session, GB.313/INS/6(Add. ), March 2012, Appendix 2. Disciplinary measures were taken against 166 military personnel and action taken under section 374 of the Penal Code against 170 other government officials and five military personnel; see Observation (CEACR) - adopted 2012, published 102nd ILC session, 2013. For more information on this third round of ceasefire negotiations, see “KNU and government verbally agree on ceasefire code of conduct,” Karen News, September 4th 2012. See Article 1 ‘General Definitions’ of the Code of Conduct for the Myanmar Army (Tatmadaw) and the Karen National Liberation Army (KNLA) in performing under the concrete ceasefire agreement entered into between the Government of Myanmar and the Karen National Union (KNU), May 2012 draft, English translation available on record at KHRG. A draft of the Ceasefire Code of conduct is available on file at KHRG offices. See “ILO lifts remaining restrictions in Myanmar,” 102nd International Labour Conference, Press Release, June 18th 2013. KHRG research areas include some of all or parts of government-delineated Kayin and Mon states and Bago and Tanintharyi regions. The Landmine and Cluster Munition Monitor has noted that Kayin state and Bago region are suspected to contain the heaviest landmine contamination in Myanmar and collectively have the highest number of recorded victims. The Monitor also identified suspected hazardous areas (SHAs) in every township in government-delineated Kayin state; in Thanbyuzayat, Thaton, and Ye townships in Mon state; in Kyaukkyi, Shwekyin, and Tantabin townships in Bago region; and in Bokpyin, Dawei, Tanintharyi, Thayetchaung and Yebyu townships of Tanintharyi region; see Country profile: Myanmar Burma, ICBL Landmine and Cluster Munition Monitor. Similarly, Dan Church Aid (DCA) which currently operates mine-risk education (MRE) programs and a prosthetic clinic in eastern Myanmar, has noted that, while verifiable data is difficult to gather due to infrequency of access, Myanmar experiences some of the highest mine accident rates in the world. DCA also notes that no de-mining programs are currently being pursued as new mines continue to be deployed by both government and NSAGs; see DCA Mine Action: Burma/Myanmar. In April 2012, the ILO affirmed the conclusion that forced labour attends increased landmine risks in a meeting in Yangon with KHRG. For further explanation, see the recent KHRG thematic report Uncertain Ground: Landmines in eastern Burma, KHRG, May 2012, pp. 55 – 59. “Report of Commission of Inquiry reveals widespread and systematic forced labour in Myanmar (Burma),” International Labour Organisation (ILO), August 20th 1998, ILO/98/32. See, Andrew Selth, Burma's Armed Forces: Power Without Glory, Norwalk: Eastbridge, 2002 p. 136. See also, Mary Callahan, "Of kyay-zu and kyet-zu: the military in 2006," pp. 36-53 in Monique Skidmore and Trevor Wilson (eds. ), Myanmar: The State, Community and the Environment, Canberra: Asia Pacific Press, 2007 p. 46. For more on the relationship between abuses such as forced labour and food insecurity, see Food crisis: The cumulative impact of abuse in rural Burma, KHRG, April 2009. For more on the relationship between abuses such as forced labour and displacement, see Abuse, Poverty and Migration: Investigating migrants' motivations to leave home in Burma, KHRG, June 2009. See also, “Central Papun District: Village-level decision-making and strategic displacement,” KHRG, August 2010. For additional evidence of an ongoing reliance on civilian populations by military troops, see Section 1, “Introduction and executive summary” above in this report. These three letters include orders from religious leader U Thuzana to attend meetings and perform “voluntary labour” on a bridge. In two other reports, a villager and a KHRG community member explain that the labour requested by the monk amounts to forced labour; see Source documents #12 and #13 below.